Now more than ever there are many choices for the parent trying to be as green as possible this holiday season. Many businesses are claiming to be green, when it’s just the same old corporate dog and pony show, but with pictures of waving grain, green grass and smiling children. Here are a few gift guides where folks have thought about how shopping truly greener can have a positive impact on small businesses, our environment and the safety of our children. -according to the Greenopia website. They’ve got a wide range of products in the guide, ranging from Electronics (small and large), Apparel and Jewelry, Home and Garden, Food and Drinks, Pets, to Kid’s Toys. And for the many of us who will be spending much less on the holidays this year (ah, how about everyone), Greenopia features a list of eco-gifts under 30 bucks. These are some good green ideas for the adults on your list. The lovely women of Cool Mom Picks have released this years Safer Toy Guide which always has beautiful and original gifts for kids from small and family run businesses. And the hardworking folks at the Center for Health and Justice just released their new PVC free product guide for the family and home. PVC, also known as vinyl, is one of the most toxic plastics for our health and the environment, from its manufacturing process, to the chemical exposures from everyday products in our homes, to its disposal. Chemicals such as lead and phthalates can leech out of PVC and into our children’s bodies. PVC causes cancer, pollutes our air and water, harms workers, leeches harmful chemicals into landfills and the surrounding area, and it contaminates recyclable plastics, according to the guide (can the list of bad things PVC is and does possibly be longer?). Ready to be PVC free, and want your gift giving to be as well? Check out the guide which lists PVC free options in the areas of baby care products, building materials, children’s toys, electronics, and school and office supplies. Z Recommends just released their “Mostly Green, Pretty Cheap Holiday Gift Guide” which includes many more affordable greener options. Aside from the Corelle dolls which have PVC, this is a great list broken down by age from 1 to 6. 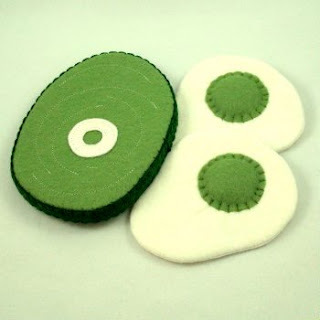 The felt food is a nice replacement for plastic play food and is reasonably priced. Kate’s Caring Gifts has some wonderful tea and cookware play sets made from recycled milk jugs, and shipped with minimum waste and energy. 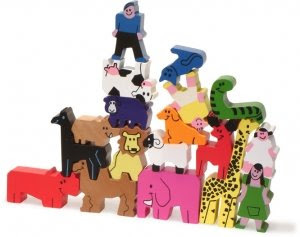 They also have this list of green and creative toys for the little people on your list. Of course, you could always visit Non-Toxic Kids and view our 2008 Eco-Friendly Gift Series to find green, safe and creative toys, clothing and gear. Also, in the next week I will also be posting the Non-Toxic Kids Eco-Friendly Gift Guide.